The fourth edition contains seven new sections with chapters on General Relativity, Gravitational Waves and Relativistic Cosmology. The text has been thoroughly revised and additional problems inserted. The Complete course of Theoretical Physics by Landau and Lifshitz, recognized as two of the world's outstanding physicists, is published in full by Butterworth-Heinemann. It comprises nine volumes, covering all branches of the subject; translations from the Russian are by leading scientists. The principle of relativity; Relativistic mechanics; Electromagnetic fields; Electromagnetic waves; The propagation of light; The field of moving charges; Radiation of electromagnetic waves; Particle in a gravitational field; The gravitational field equation; The field of gravitational bodies; Gravitational waves; Relativistic cosmology; Index. 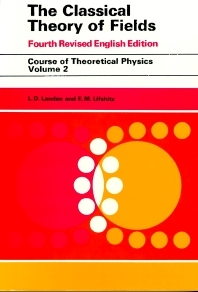 The Classical Theory of Fields, the second volume of the famous Landau and Lifshitz Course of Theoretical Physics, provides a fast and solid way to study the special and general relativity, as well as electrodynamics. The reader will find several original discussions that are not usually covered in other books. The examples are quite interesting and they cover problems that were -- or could be -- the subject of a good publication at the time of development of general relativity or even in the current days.